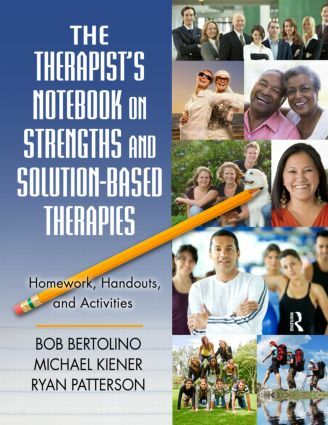 The Therapist's Notebook on Strengths and Solution-Based Therapies offers multiple pathways for those in helping relationships to employ strengths and solution-based (SSB) principles and practices as a vehicle for promoting positive change with individuals, couples, and families. The 100 exercises in this book are based on a series of core principles that are not only central to solution-based therapies; they have been demonstrated through research as essential to successful outcome. Readers will learn about processes and practices that are supported by research and are collaborative, competency-based, culturally sensitive, client-driven, outcome-informed, and change-oriented. The text is categorized into seven parts, each formatted similarly to ensure easy accessibility. Practitioners will find their therapy enhanced, with a greater ability to improve their clients' well-being, relationships, and social roles. 5 Stenographer: I Said What? 10 Using Positive Relationships to Enhance Positive Coping Mechanisms: Who Makes You Feel Good? IV.1 Life Pursuits and the Meaning of It All: Why Am I Here? 9 Dear Diary: What Were My Strengths Today? 9 Raindrops on Roses and Whiskers on Kittens: What Are My Favorite Things? 9 Interviewing Your Supervisor: Is Your Supervisor as Strengths and Solution-Focused as You Are?